Young Eponine was raised to be a thief. Her mother and father were crooks, and expect her to live up to their malicious and untrustworthy reputation. Eponine knows stealing from is bad, but her family are poor and the pretty trinkets she pinches bring her mother such joy. It’s a dog eat dog world after all. One day another young girl enters her Eponine’s life. She has golden hair and despite the rags her mother places her in she is so so beautiful. Cosette is her name and she is the only person who has ever shown Eponine kindness - even though at times she doesn’t deserve it. Sixteen years later and Eponine is no longer a young girl. Her family may have relocated to Paris but they haven’t stopped their criminal ways. She consistently seeks a better life. Her world is full of darkness but she tries to find happiness and goodness in the small things. One her many ‘lights' in a young boy called Marius. Charming, wonderfully handsome and heartbreakingly kind. The only problem with loving him is that he's in love with another girl. A girl with golden hair and who is beautiful inside and out. Cosette. I’m gonna be completely honest with you guys here, I totally only picked this up because I’m a huge fan of Les Miserables musical and Eponine is totally my homegirl - and one of my favourite musical theatre characters of all time. If, like me, you’re also a fan of Les Mis or the original novel by Victor Hugo, you probably think you know Eponine Thernadier’s story back to front. And yes, the storyline for this novel is familiar and the timelines certainly do match up on many occasions - her ending is also unfortunately still canon *cries*. What Fletcher has done with A Little In Love, however, is take that canon story and expand it. As the love-lorn third wheel to the Marius/Cosette love story, Eponine for me is generally one of the more relatable characters from Les Mis. 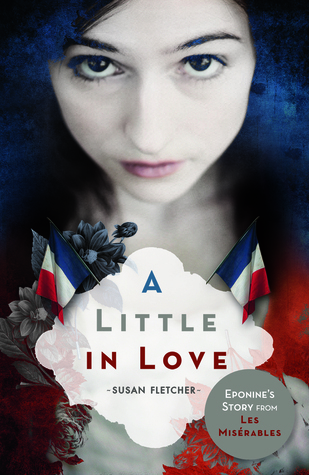 But by delving in her past and backstory, Fletcher presents Eponine as more than just the girl who pined after a boy. Strong-willed, brave and always striving to do good, Fletcher's Eponine deals with the struggle of with being as heartless as her family and her want to become a better version of herself. Though we do see a good portion of the story dedicated to her love of Marius (who is just as charmingly clueless of his effect on our ‘Ponine), equal credence is given to Eponine’s fervent quest and determination to be a good force in the world. Obviously Eponine is our leading lady in this instance, but there is some nice insight into the Thernadier’s world. Subplots surrounding Eponine’s relationship with her mother are also really interesting, and I do love Eponine’s ongoing contrast to Cosette’s life - something I always found irritating in the musical, but loved how it played out in this novel. I’m being biased but I personally really enjoyed the book, though other readers will notice that A Little In Love in definitely geared towards a younger audience. However, it’s important to remember before criticising Eponine’s vernacular that she is very much a girl experiencing young love in all forms. She’s a little naive but learns every step of the way, and knowing her ending only makes her story even more heartbreakingly tragic. For lovers of...Les Miserables (the musical, film and the Victor Hugo novel), Moulin Rouge, and Never Let Me Go.